You are browsing the archive for Advocacy. 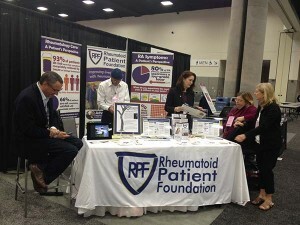 In October, for the third year in a row, I was privileged to attend the American College of Rheumatology’s (ACR) annual scientific meeting as a volunteer with the Rheumatoid Patient Foundation (RPF). It is truly an honor to help represent the patient voice for people with Rheumatoid Disease (PRD) alongside a group of amazing volunteers, board members, and RPF’s founder, Kelly Young (a.k.a. RA Warrior) who inspire me so. Kelly’s call to start the first organization ONLY for Rheumatoid Disease (RD) / Rheumatoid Arthritis (RA) has led to substantial progress in under three years. RPF board member Dana Symons did a great job covering this year’s RPF session on patient engagement and RPF research posters based upon patient-driven research for the RPF blog. Kelly also wrote more about the behind-the-scenes of getting to this point on her own blog. And this week, we're hearing from other members sharing about the reasons they've seen firsthand how important this work is. The Rheumatoid Patient Foundation is a 501-C3 non-profit organization by patients, for patients. Our mission is to improve the lives of people living with Rheumatoid Disease. Our vision is a world where no one suffers from Rheumatoid Disease. To achieve this objective, we, the RPF work with patients, physicians, researchers, and other rheumatology stakeholders to address the needs of patients and to create pathways to better care for PRD. There is much more work to be done. The Rheumatoid Patient Foundation is volunteer-based, and we rely upon the support of members and donors in order to do this important work. We ask for your help today as part of the #GivingTuesday campaign to help us continue to improve the lives of people with Rheumatoid Disease (PRD) in the coming year. To join our efforts, kindly click here to become a member of RPF. To make a tax-deductible end of year donation, click here. Add your voice and help our vision become a reality. Together we CAN do more. Gwen is a friend of our daughter. She is energetic and enthusiastic and talks very, very fast. She greets people with a smile and a hug and makes friends quickly. She likes unicorns and laughing and doing things for other people. One day, Gwen and some of her friends were joking around and they decided to rename everyone’s favorite hump day, Gwensday Wednesday. They felt it needed a little more pizzazz to get people through to the end of the week. So Gwen made a community page on Facebook and within a short matter of time other students from the high school began to like her page. Gwen holds various “contests” on Gwensday Wednesday such as seeing who has the cutest sibling pictures and the like. She also does other things to build community like getting other students to help decorate every locker in the high school on February 13 so that no student would go without a Valentine on Valentine’s Day. No small feat for a school with over 1500 students. Then someone suggested that Gwen should design some Gwensday Wednesday t-shirts for fun and so she did. She sold the shirts to other students and donated the money to local charities like the humane society. As the friendship between Gwen and our daughter grew, Gwen became aware of how Rheumatoid Disease affected Kim. And Gwen decided to do something about it. 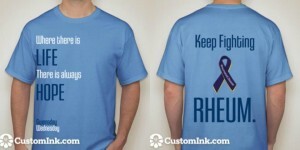 Of her own initiative, Gwen chose to design a t-shirt that would help raise awareness for Rheumatoid Disease. As she worked on the shirt design she also decided to donate the money that would be raised through their sales to the Rheumatoid Patient Foundation. Before she had even shared the design of the t-shirt she was getting verbal orders from students and teachers at the high school. Yesterday, she unveiled the t-shirt design and it looks amazing! This is how one teenager and her friends chose to devote themselves to do something positive. Teenagers who saw a need and decided to help in any way they could. Gwen made herself part of the Rheum community simply because she cared and that one act of caring will have more of an impact than she could possibly imagine. You can find and like Gwensday Wednesday on Facebook at https://www.facebook.com/GwensdayWednesday. NOTE: Gwen has generously shared her design with us so that we could offer it in the RPF store. Click here to purchase your own "Gwensday Wednesday" t-shirt.